It’s always a delight for us to see how our customers use Surface View in projects, and we were totally enamoured with interior designer John’s bold yet liveable design scheme for his client. Featured in Kitchen Bedrooms Bathrooms February issue, John’s design transforms a top floor Victorian flat to take on a whole new identity. Purchased by Steven, a professional who had bought the city centre flat in Edinburgh as an escape in the working week. The flat had originally served as a rental and despite being a period property, the Victorian flat had no redeeming original features. In desperate need of an update, the flat was ready to shed its tired white walls in favour of something more exciting. The bathroom after John’s redesign. With a seemingly blank canvas, the brief was to create a calm and reflective city retreat with the wow factor. John had just 12 weeks to transform the space from functional to luxurious. 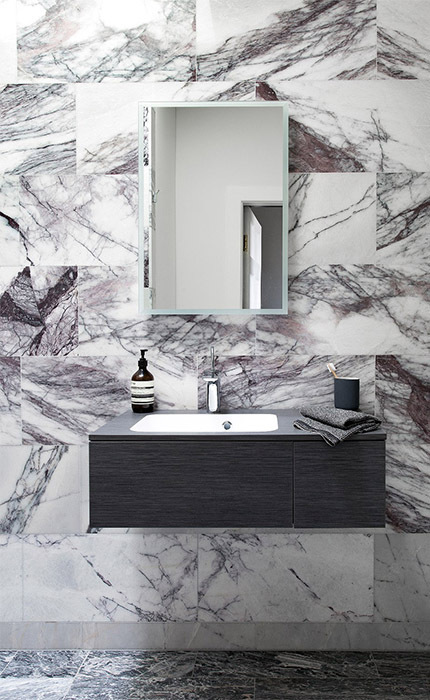 The short timeline meant that aside from the electrical and plumbing works needed to facilitate the modification of the bathroom, cosmetic updates were the bulk of the changes. 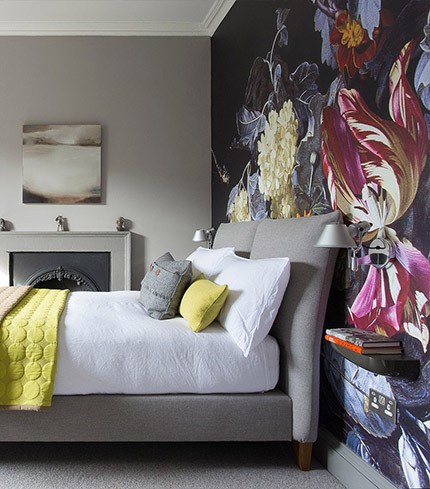 Working with colour, texture and fittings throughout the flat, John worked alongside the client to create a design which appealed to his tastes and created depth and interest in the one bedroom flat. It's so bold and adds a truly sumptuous note to my client's home. 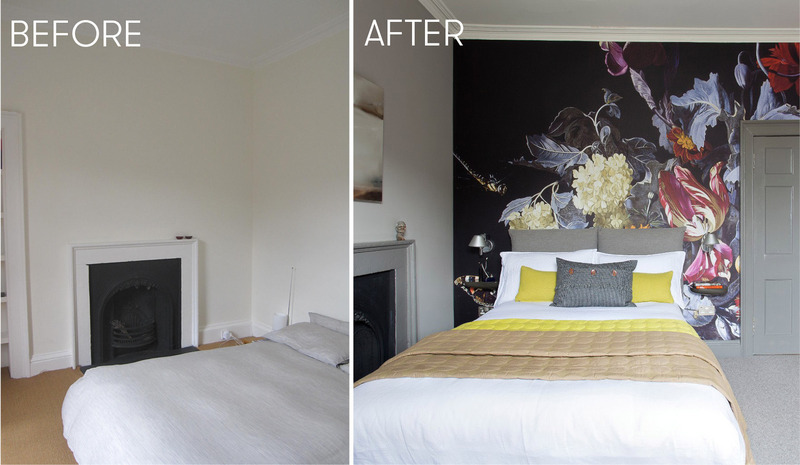 Tacking the bedroom, a feature wall had always been part of the initial design but in what form this took was still to be decided. 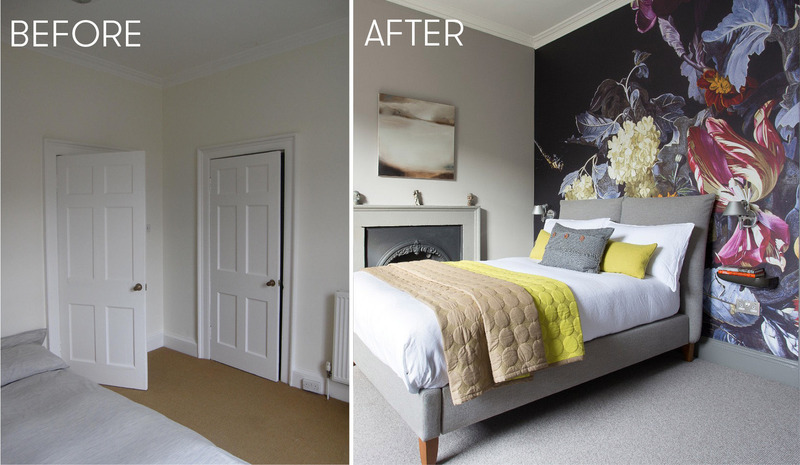 John explains “originally we thought of some kind of panelling or a large oversized painting for the bedroom, but after a lot of research we came across Surface View and the options offered were perfect for what we were looking for”. Drawn in by the colours, John selected our ‘A Vase of Flowers with a Watch’ mural from the Ashmolean Museum collection. The rich red tones gave a sense of drama, mixed with cool blue shades the floral design offered the calmness that John was looking for. His favourite piece in the home, John says of the mural “it is so bold and adds a truly sumptuous note to my client’s home”. Painted by Dutch Still Life artist Willem Van Aelst, one of the most successful and influential still-life painters of the 17th century. His stunning floral paintings were lavished with details, layered with flowers, fruit and teamed against stunning marble table tops. Pairing the mural with Farrow & Ball’s rich mid grey ‘Worsted’ on the walls and ‘Mole’s Breath’ on the woodwork and doors. The thick natural yarn wool carpet, upholstered bed and minimal accessories finish it off and give a sense of luxury. What do you think of this design scheme? 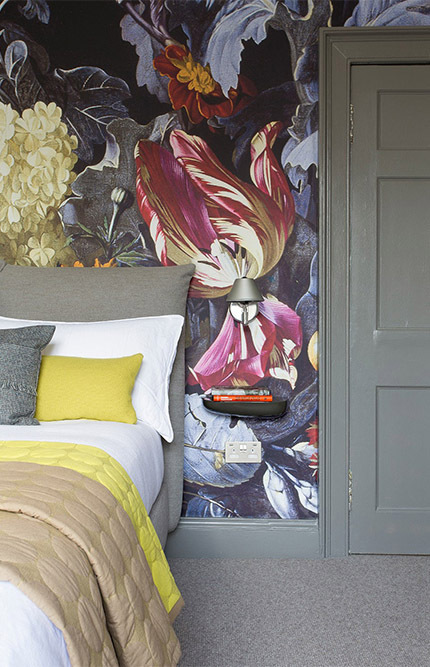 Are you inspired by John’s work to add a feature wallpaper mural in your home? Let us know in the comments or on social media @surfaceview. To see more of John's work, visit his website here.